Occasionally gameplay over my weekend feels like it has to be chiseled out of small crevices, and taken in bite size portions similar to a Snickers Fun Size you get on Halloween. This was one such weekend as graduations parties, outings, and other issues plagued us, in this otherwise beautiful weather and slow down period between Memorial Day and July 4th. I originally had this weekend pegged (as I did the weekend previous) as a second vintage computer weekend, but minor computer repairs and games that had yet to arrive prevented that, so hopefully next weekend. Submarine Command (Atari 800) – Adding to my upcoming vintage computer weekend will be some Atari 800XL play including this little known title, which I picked up CIB for less than $6. Q*bert (Basic Fun Mini-Arcade) – I’ll go into these machines as part of this weekends plays, but Q*bert is the second of two color LED games in the series of four games. Space Invaders (Sega Saturn) – This is another Saturn import that includes several arcade versions of the original game. I look forward to playing this one, and I just might be doing a Space Invaders series later on. Star Wars: Rebel Strike-Rogue Squadron III (Nintendo GameCube) – As per my YouTube video I’m going to be spending some time on the GameCube this year, and figured I had to pick this one up, since we are also in a Star Wars frenzy at home now too. Anyway, YouTube videos of this one looks pretty amazing, so can’t wait to get it. Astrokill (PC-Steam) – I’ve been picking up a lot of games on Steam lately, especially as the summer sales roll on, and this one was on my Steam wishlist and finally became half off. Essentially, it’s a starfighter combat sim that looks pretty gosh darn good and I can’t wait to test my gaming PC with it. 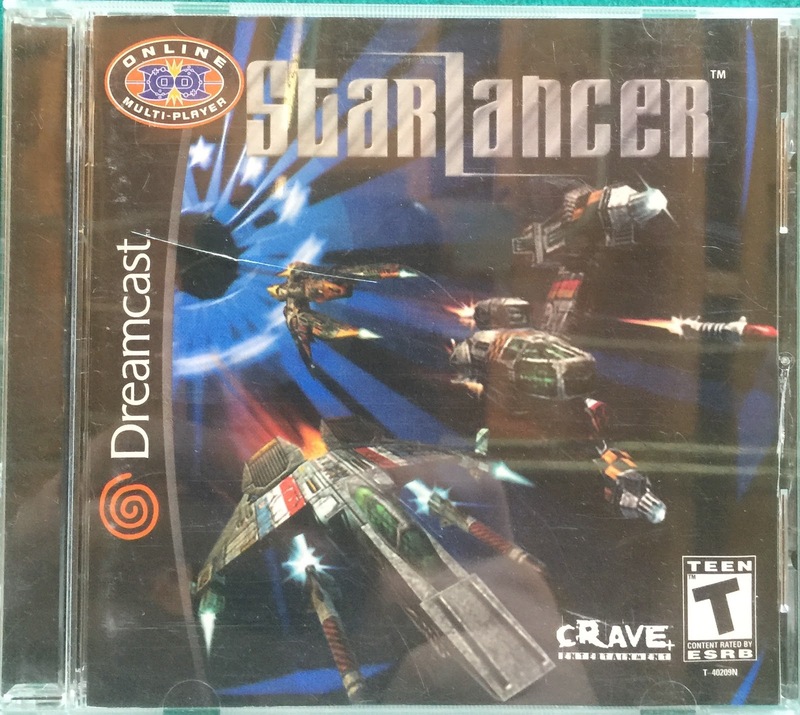 Starlancer (Dreamcast) ⭐️⭐️⭐️⭐️⭐️- As I understand this is another Chris Roberts creation, although it isn’t set in the Wing Commander universe. This has a familiar plot to it as a lot of other space games and Sci-Fi do, of a solar system at war. Think The Expanse but much more epic in this game. This one is actually a PC port, but playing it on the Dreamcast I could barely tell. Despite being a few generations behind this one looks great even after all this time. Despite having the handicap of being a console game ported from PC this one plays pretty well, although there are a few notable control schemes that don’t work that well like targeting, and weapons switching. As far as originality the general plot is derivative of a lot of other science fiction properties, however it’s a nice mix of those properties with some familiarity bought from games like Wing Commander. 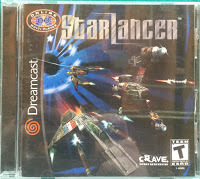 This tends to be a more expensive Dreamcast title and I can see why, and I can also tell you that it should be a definite add to your collection. 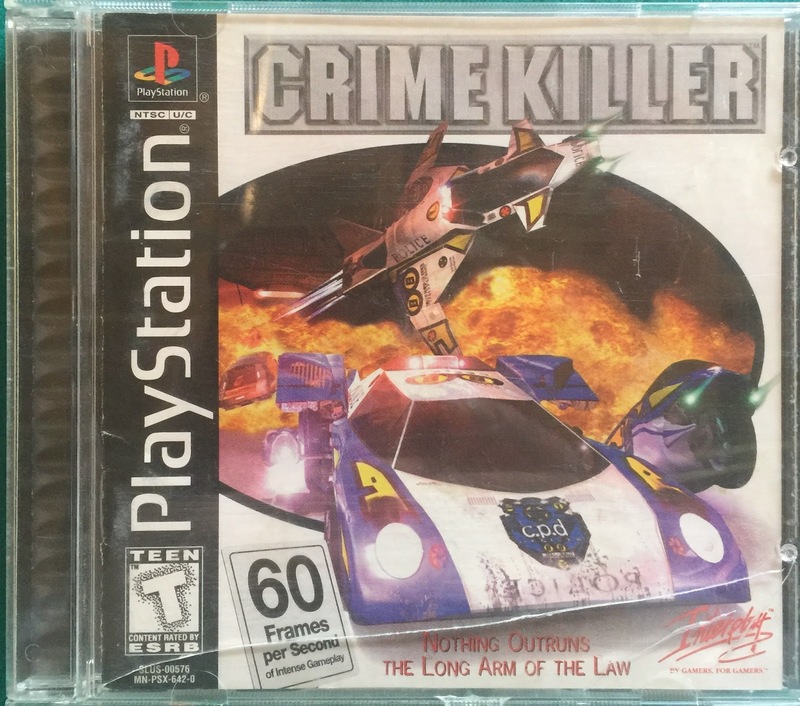 Crime Killer (PS1) ⭐️⭐️⭐️⭐️⭐️ – I’m always on the lookout for obscure games and this one was suggested to me over Twitter as one such game. The suggestion actually paid off since upon playing it, I found out the YouTube play-throughs that I have seen did the actual game no justice. What I found upon playing it was a game that was highly addictive, and that felt and played damn near an arcade game. Graphics wise it falls victim to it’s era but you quickly find out that all that is highly forgivable. The game itself plays well and is extremely intuitive namely in that the game itself is remarkably fun. The game’s setting is in a not-too-distant future, in which an unnamed city resorts to having advanced police cars, motorcycles, and fighter jets in order to combat high levels of crime generated by a crime organization. The beginning intro tells the entire story and is cheesy yet somewhat touching. The game is 100% original in it’s storyline although it has a Road Blasters type feel to it. If you don’t have this one for your PlayStation make sure you get it, since it’s fairly inexpensive and definitely worth it. 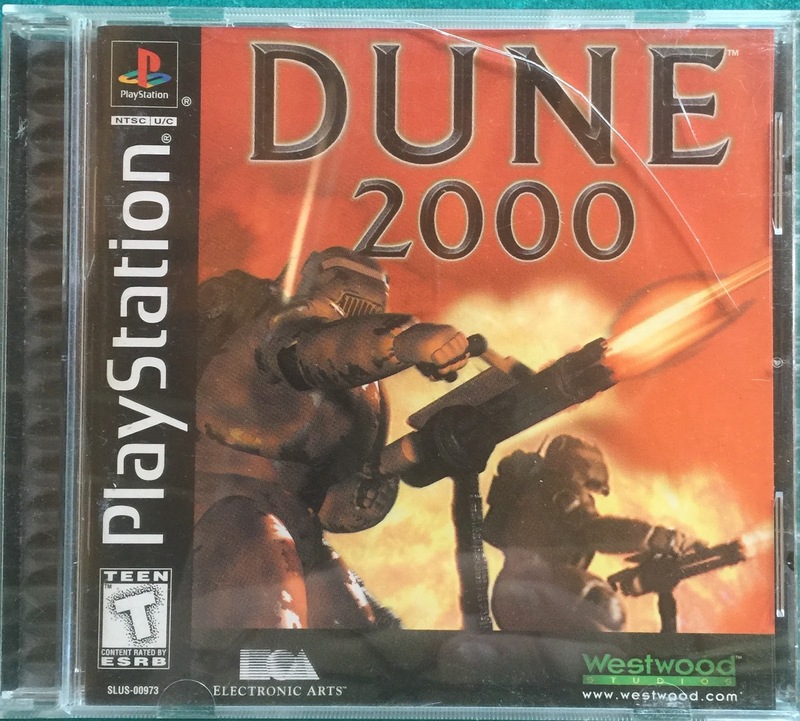 Dune 2000 (PS1) ⭐️⭐️⭐️1/2 – Dune 2000 was Westwood Studios reboot of their earlier Dune game, but meant to take advantage of the game mechanics Westwood had learned from the Command & Conquer franchise which followed after the original Dune RTS game. This game is of its era, and filled with plenty of FMV goodness including a bit of starpower. Basically, this is the first C&C dressed in a Dune skin and graphics wise it looks good, and is on par with a lot of other Westwood games of that time, and being comfortably 32-bit blocky which for me has a lot of nostalgia. Control wise though like other C&C games ported to the PlayStation from PC, there are obvious issues. The control mechanisms to me don’t feel right of course, but that’s as someone who has played Westwoods best RTS games on PC, meaning I feel as if I am at a bit of a disadvantage commenting on the controls. I just feel that a mouse would work better for a game like this and give a player more control. To say the least though once you learn how the PlayStation controller works in the game, gameplay does get a little easier. Originally wise this is a reboot of an earlier Dune title, and based on C&C but I can’t help but feel that it all works and is definitely different enough to give the game some of it’s own character. I would only suggest adding this one to your PS1 collection if you are a Dune, Westwood Studios, RTS, or C&C fan. 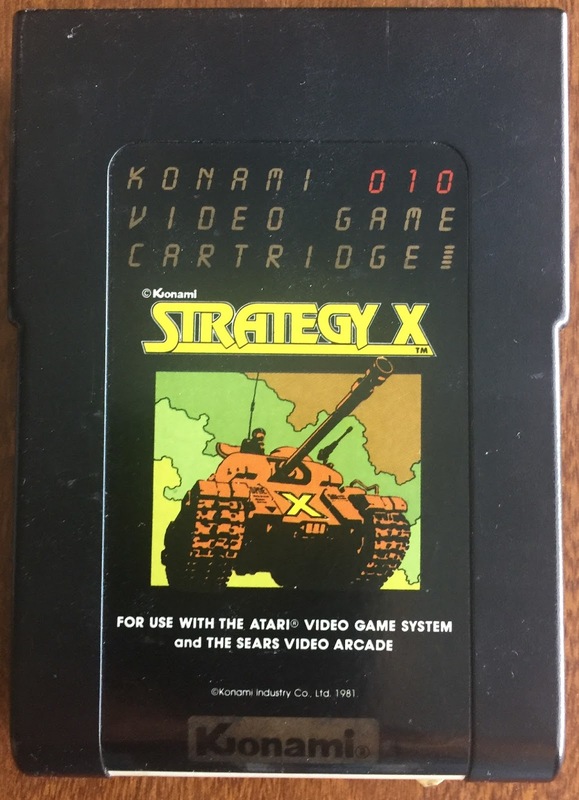 Strategy X (Atari 2600) ⭐⭐⭐- This is an oddly rounded top Atari 2600 cart from Konami itself. Plugging the game in I did a facepalm as it looked suspiciously like a game I reviewed a few weeks back called Frontline. 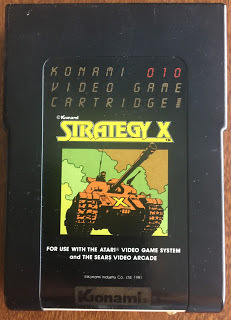 Of course both games were arcade ports, but Strategy X focused on a tank as opposed to an infantryman like Frontline. Companies like Taito, Konami, and Capcom did tend to have a lot of games on arcade in that era that tended to have similar looks, premises, and play methodologies, which later ported to home consoles. On the Atari 2600, Strategy X is a forced vertically scrolling shooter with a tank weaving its way through obstacles (assumably trees) while dealing with various enemies. I could best describe it as River Raid meets Frontline, or if it helps think of the NES’s Iron Tank being on the Atari 2600. Graphics wise it’s true early Atari 2600 in looks, with the tank being the only really impressive graphic on the screen with its moving treads. Play wise it’s responsive, but the tanks inability to move more than four directions does costs the player, and although the trees (or whatever they are) can be driven through it does cost your tank fuel, which ala River Raid you can get more of buy running over fuel tanks. Originality wise it is a bit lacking since, as with the above mentioned Frontline, games of this kind were common back then. Overall, it’s a good game, but it would be more worth adding to your collection for its unusual cart than the actual game. Desert Falcon (Atari 7800) ⭐⭐⭐ ½ – Slowly closing the ring on the remaining Atari 7800 titles I don’t have is Desert Falcon. I’m just going to start off by saying graphically it’s a pretty impressive looking game, and proved the Atari 7800 could produce graphics on par with the NES. Also, unlike the 2600 version, which I also have, I can actually tell what’s going on, and what everything is. Control wise though it’s not so hot, even with the CX-78 joypad, since controlling side to side, back and forth, and altitude all on the same stick is kind of frustrating and got me killed more than a few times. 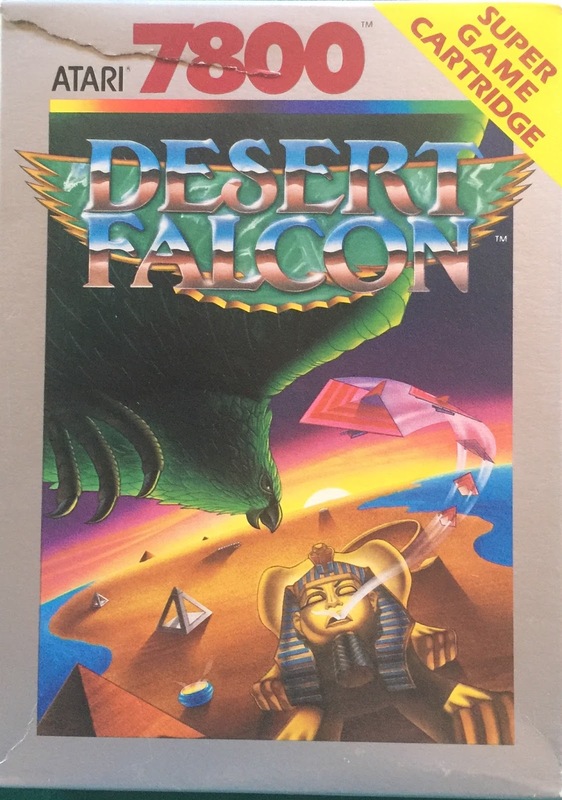 Originality wise this is a game that has it in spades, since it’s a typically late Atari oddball with a strange premise about a falcon stealing Egyptian treasure. 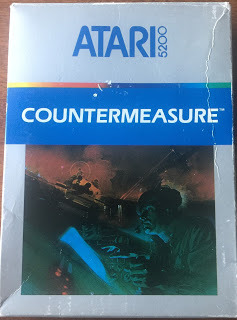 As an Atari 7800 fan or collector you have to have this game, not only to complete your collection, but to show the old 7800 could go head to head with the NES when it wanted to graphically. 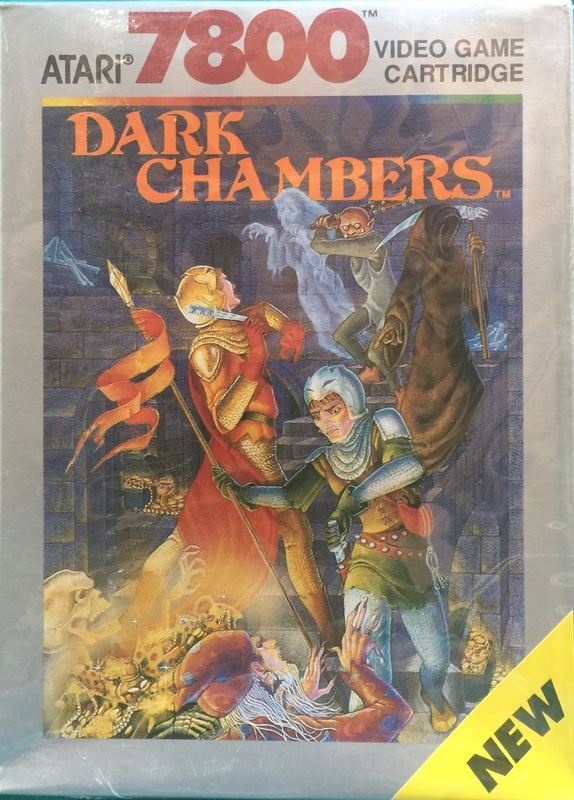 Dark Chambers (Atari 7800) ⭐⭐⭐⭐ – I usually hit on originality last but on this games originality is the 800 lb gorilla in the room, since Dark Chambers is more or less a direct Gauntlet rip off minus being able to choose your adventurer type. With that said though it’s actually a pretty good game, even if it is a blatant rip off. Graphics wise it truly has the look and feel of an actual arcade game, and of what late 8-bit Gauntlet looked like on the NES. Play wise I was using the CX-78 joypad, which worked out really well on this game, and gave me a pretty fluid and responsive experience and made this game a pleasure to play. Overall, I found that it’s actually a great gaming experience on the 7800 and despite being an obvious clone its worth adding to any 7800 collection. Galaxian (Coleco Mini-Arcade) ⭐⭐⭐⭐⭐- With Coleco Mini-Arcade you pretty much know you’re getting a light show dressed up as an arcade game, albeit a very cool and entertaining one. 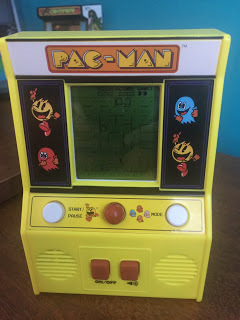 I love my Pac-Man for instance and have spent a lot of time playing it, even though it lacks the fluidity and depth of playing it on a console. When I got Galaxian though I was shocked, this game not only plays fluidly but plays fast and is highly challenging. Although you don’t get the variety of alien attackers you do in the various console ports, what you do have works just as well, and gets just as complicated as you move on to other levels. 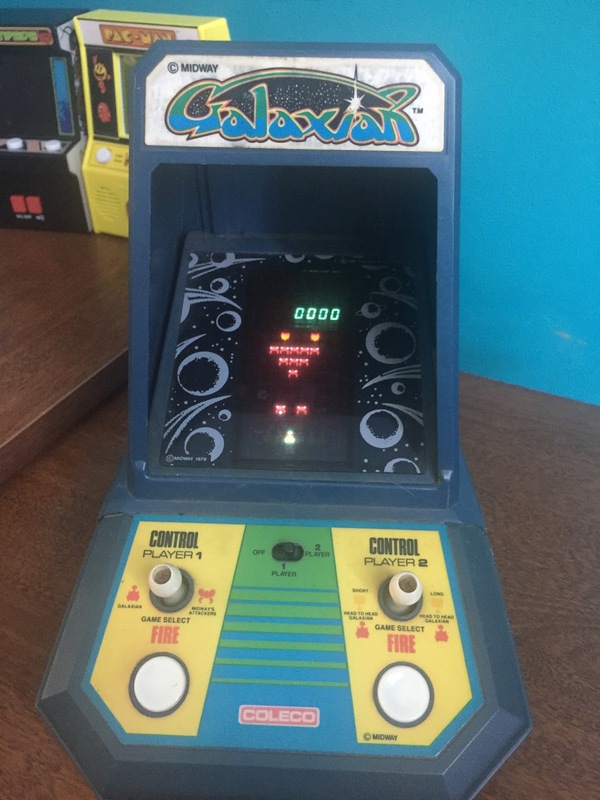 I will even make the controversial statement that Galaxian on the mini-arcade might actually be a better port than what we got on the Atari 2600. So if you going to get only one Coleco Mini-Arcade this has to be the one. 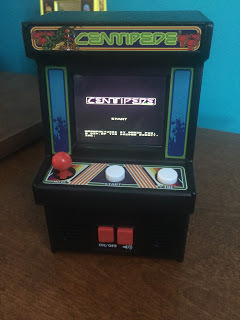 Centipede (Basic Fun Mini-Arcade) ⭐⭐⭐⭐⭐ – A few months back I picked up Basic Fun’s LCD Space Invaders mini-arcade, I even mentioned on my Facebook page, and Twitter about how I picked it up for next to nothing from Bed, Bath, & Beyond. The LCD game was good, but at times it will just kill the game on higher levels. Buying this I also knew there were Pac-Man, Centipede, and Q*bert versions out there but felt no need to collect them. 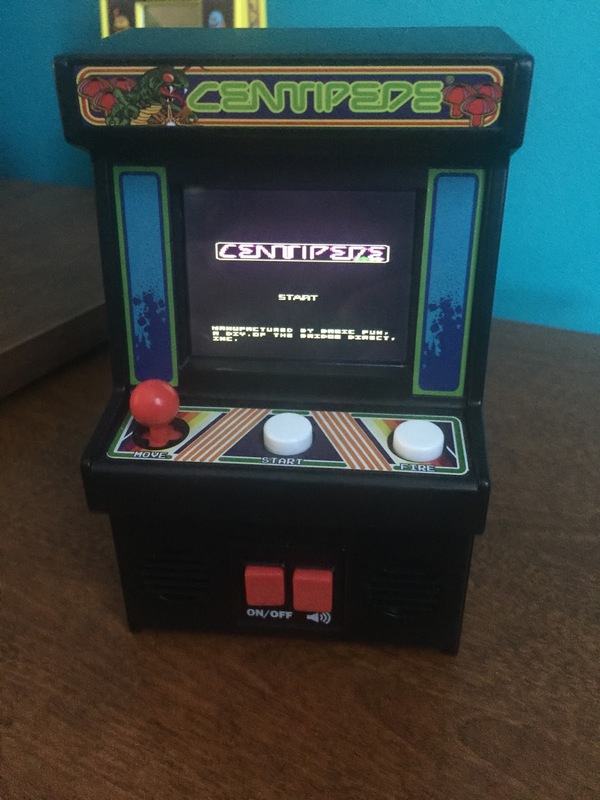 Then one day while listening to The Retro Leagues Hugues mentioned that his wife had gotten him the Centipede, and Q*bert versions and how each was like a miniature MAME cabinet. It’s at that point I knew these must be different than the LCD Space Invaders I had and the Pac-Man I had seen. Looking it up I found that each had small full color LED screens and produced games that very much looked like the real deals. Control wise for only being operated with a small joystick and button the game works pretty well, and provides pretty compelling gameplay for it’s small size. Overall this is a nice pickup for any arcade game lover. 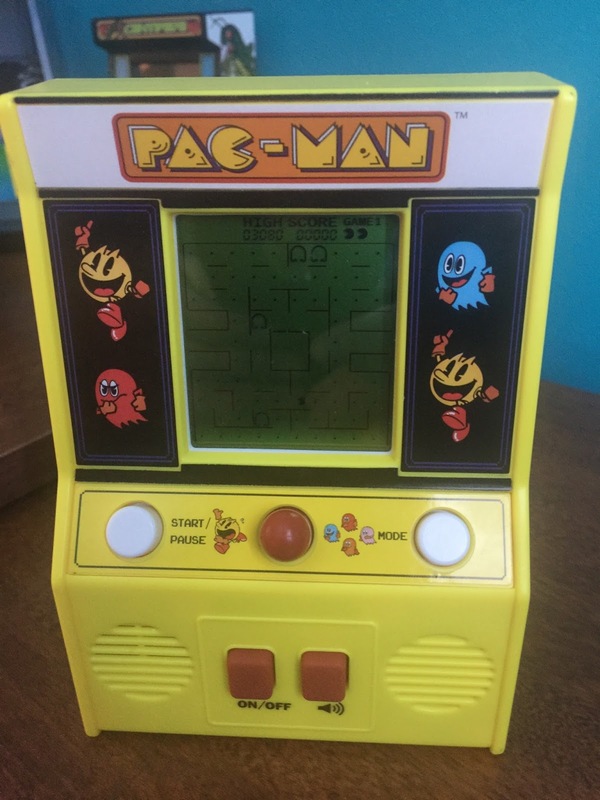 Pac-Man (Basic Fun Mini-Arcade) ⭐⭐⭐1/2 – Looking to collect all four machines now I picked up the Pac-Man LCD mini-arcade. Like the Space Invaders version this one produces a pretty good LCD emulation of the arcade version, and also like the Space Invaders version has fairly spot on sounds and music. Control wise like the above mentioned Centipede you are dealing with a small joystick, but it works out well and is fairly responsive. An obvious buy if you’re looking to get all four machines. 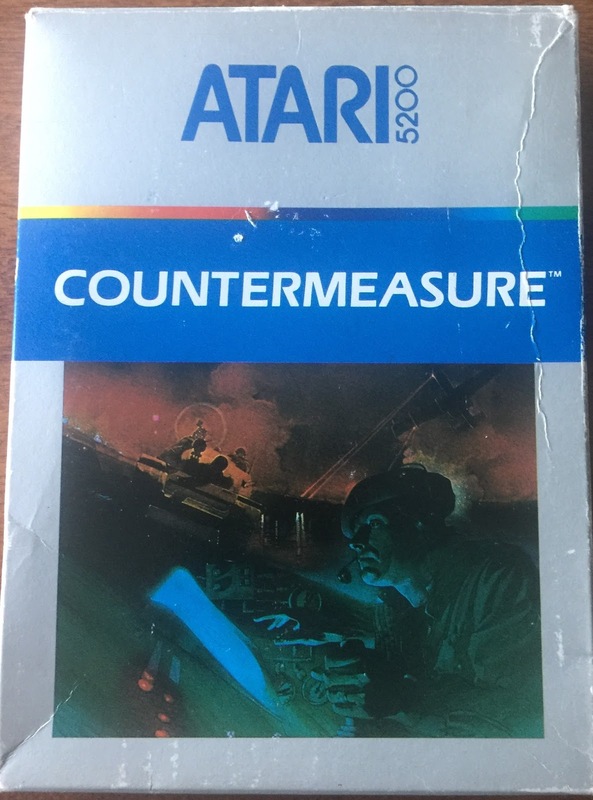 Countermeasure (Atari 5200) ⭐⭐⭐1/2 – Think of the first Atari 2600 game I played this weekend Strategy X but a little more complicated and with better graphics. The plot revolves around a nuclear missile silo being held hostage by terrorists and your tank is sent to find the code and disarm the missile. Like Strategy X your tank can roll through trees at a cost in fuel, and you must fight anti-tank pillboxes protecting the silos.Of course being a later 8-bit title trees look like trees, lakes look like lakes, houses like houses and well you get the picture. On top of that is the code collecting element that reveals the order the letters must be in to disarm the missile, luckily it’s only three letters and you can guess if you miss. Graphics wise the game looks pretty good, and it’s easy to see the quantum leap in graphics the Atari 5200 had over the Atari 2600, although it falls short compared to some other 5200 titles that could put the system on par with the NES. Control wise this is one where the 5200 controller shows the possibility of dual button games with the bottom button firing, and the top controlling the turret although the Atari 5200 standard controller does make this a bit tenuous, and the directional control of the tank with the joystick is a bit laggy. Originality wise once you get past the Strategy X parallels the game is pretty darn original, especially the code breaking elements. As an 5200 fan, and as a collector I have to say this one is worth adding to your collection. So with 5 consoles, and 3 free standing platforms played covering 10 games I had a pretty good weekend, despite it all. 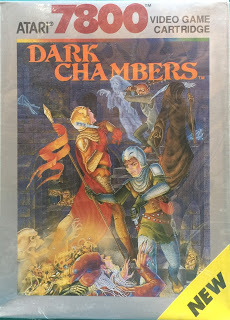 Hopefully, with new vintage computer games in place I can get to that vintage computer weekend round two I’ve been waiting for. Until then have a great week, and God Bless! !